Welcome to North Fayette Parks and Recreation registration website! Extended rental hours for the Banquet Room and the Party Room are available. Please visit the Community Center to reserve these times. 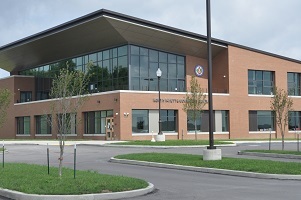 The North Fayette Township Community Center is located at 580 Donaldson Road in Donaldson Park. The state of the art facility provides the residents of North Fayette and the families of the West Allegheny School District with a safe and enjoyable place to play, exercise, and hold events. The Community Center offers an indoor walking track, a full size gymnasium including fitness equipment, party rooms, and large banquet facility. The Banquet Room is situated at the top level of the community center. This dramatic space serves the community for special events and gatherings. It is surrounded by an extensive outdoor terrace and sixteen feet floor to ceiling windows allowing you to enjoy the beautiful vista. The party rooms on the first floor can be rented as one large room or two smaller rooms for many occasions. The gymnasium can be rented for pick up leagues, practices, and more. Special party room and gym packages are also available. The North Fayette Township Board of Supervisors and Staff are pleased to provide year round recreation opportunities for residents of all ages.